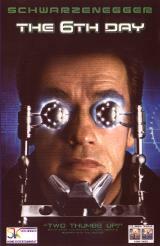 Superstar Arnold Schwarzenegger is Adam, an pilot in the very near future who is having a serious identity crisis. An evil corporation illegally cloned him, and now they're trying to kill him to hide the evidence. Torn from his beloved family and faced with a shocking exact duplicate of himself, Adam races against time to reclaim his life and save the world from the underground cloning movement.